Ju Da Hye headed for her senior’s room with a handful of sweets. As their teacher had instructed, the two had stayed behind in Sichuan in order to pull the Alliance to their side. Ju Da Hye made a confused face after sticking her face into her senior’s room. Normally, her senior would be staring at his face in a mirror, but this time, he was thinking about something on his bed with a serious face. Ju Da Hye was extremely surprised. Why was her senior, the crystallisation of narcissism, not doing anything? Ju Da Hye thought that her senior was giving it his all in order to ally themselves with the Alliance. She put the sweets in her hand down on the table, and spoke with a touched face. Juk Hyul Myung looked at Ju Da Hye with a confused expression. Juk Hyul Myung smiled a bit as he bit into one of the sweets Ju Da Hye brought. Juk Hyul Myung scratched his head in annoyance. While he was doing that, Ju Da Hye stepped backwards with a shocked face. Come to think of it, senior was always kind of suspicious. After all, there were many beautiful women in the North Sea Ice Palace, but the senior never even glanced at these women. Because of senior’s cold attitude towards women, there were countless rumors that suggested that he was homosexual, and tended to kidnap little boys to his room every night. Ju Da Hye just smiled whenever she heard those rumors, but when she actually came in contact with the senior’s hidden secrets, she shuddered a little. For senior, a man who possessed skin that resembled those of a woman, it seemed that a person who resembled a young boy would suit him best. Juk Hyul Myung frowned when he saw his junior think about perverse thoughts regarding his sexuality. He began to stomp his way towards his junior. Juk Hyul Myung pulled at Ju Da Hye’s cheeks with one hand as he ate his sweets with the other, then sighed soon after. He was regretting the fact that he missed the chance to fight Gu Hui. Juk Hyul Myung was sure that he would’ve been able to give it his all when fighting an individual like Gu Hui. But since he had to suppress his urges when meeting Gu Hui, he was feeling really annoyed. He wanted to break something. Just when he was about to let out the burning desire to fight inside his body, a suitable target he could fight had already disappeared. Juk Hyul Myung glared at his junior, who pushed him away with force. 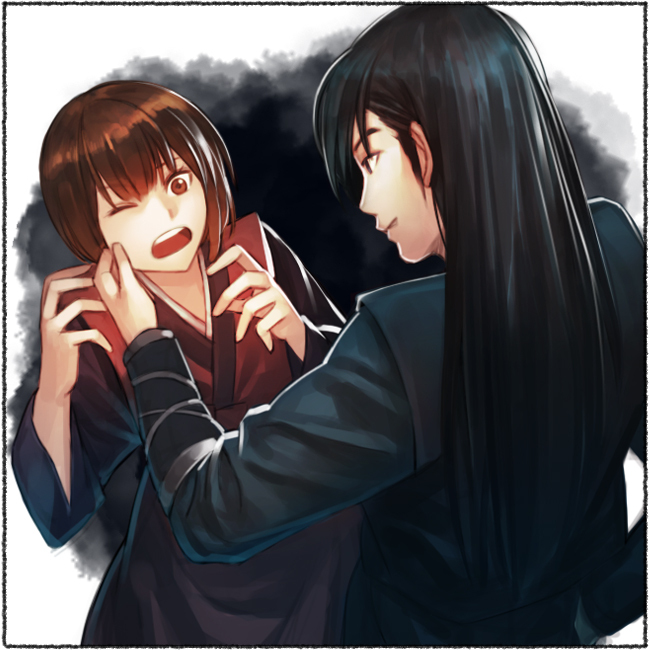 When Juk Hyul Myung looked upon his junior in order to exact upon her his wrath, he could see her clasping her left cheek while crying a little bit. Ju Da Hye’s cheeks were swollen to an extreme degree. It almost looked like she was holding a piece of candy in her cheek. When Juk Hyul Myung’s eyes widened in surprise, Ju Da Hye’s eyes emanated a beastly aura as she stared at Juk Hyul Myung with hostility. Normally, Juk Hyul Myung would’ve immediately punished his junior for being so insolent, but since he was at fault for making her stare at him like that, he just stood in place, not knowing what to do. Juk Hyul Myung stepped backwards unconsciously as he answered. That was because the aura his junior was emitting was extremely fierce. If he tried to have a go at her when he couldn’t even fight her properly, he would surely be punished badly. Junior’s swollen cheeks made her sound a little different from usual. It was quite entertaining, but laughing would surely bring Juk Hyul Myung calamity. When Juk Hyul Myung responded as such, Ju Da Hye pointed her finger towards the exit of the room. This time, Ju Da Hye pointed her finger at herself and spoke. Juk Hyul Myung couldn’t retort to that, largely because he had to agree to it. His junior really looked bad at the moment. Bad enough to have a negative effect on someone’s mental health. And as always, Juk Hyul Myung’s bad habit of speaking his mind propped up, and he managed to say the words in his mind out loud. He instantly regretted saying that, but it was too late. When Juk Hyul Myung flinched a little and glanced at Ju Da Hye, he could see Ju Da Hye pointing her finger out the door. Juk Hyul Myung ran outside without being able to say anything in retaliation. Juk Hyul Myung began complaining when he came outside. Surely, what he did this time was a little over the line. But wasn’t junior really overreacting to this? Maybe it was because he was taking it too easy on her. Juk Hyul Myung, who had been walking around trying to find a doctor, spotted a decent teahouse and decided to go in. His current predicament with his junior was already long forgotten. Juk Hyul Myung looked up at the blue sky, and relaxed himself for a bit. But he soon looked somewhere else when he felt something strange touch his senses. Someone was coming here after parking a carriage. The employee of the teahouse asked this to the red-haired girl as the girl descended from the carriage. Neng Ha Young began to look for a suitable seat, then happened to cross her eyes with Juk Hyul Myung’s. Neng Ha Young began to think, trying to figure out who this person in front of her was. Where was he from? Since she was still within the Alliance’s territories, she was extremely alert. She had no real worries since Shi Yup was with her, but she didn’t want to cause a commotion. Since Juk Hyul Myung was wearing a set of normal clothes, instead of the North Sea Ice Palace’s martial uniform, Neng Ha Young was unable to identify Juk Hyul Myung. She could only see him as a handsome martial artist. One that was too handsome, at that. When the employee called out to Neng Ha Young, she took a seat where she would be able to observe Juk Hyul Myung and spoke. When the employee took the order and disappeared, Neng Ha Young took a more comfortable position in her seat, and closed her eyes. Right now, the martial world was in absolute chaos. There were small skirmishes everywhere, and many of the minor houses affiliated with the Alliance were getting pushed around everywhere. Compared to that, the merchant companies and martial clans that allied themselves with the Heavenly Demon Church were going around doing whatever they wanted. The Black Moon Guild was fortunately able to gain several beneficial things by taking advantage of the situation. The rule of the Heavenly Demon Church would likely last for about a decade. Just what should she do in order to gain benefits during that time period? While Neng Ha Young was thinking that, Juk Hyul Myung was staring at Neng Ha Young with a serious face. The moment that girl appeared, something came into Juk Hyul Myung’s sharpened senses. However, he couldn’t see anything. This was a first. He didn’t like it. The girl didn’t interest him in the slightest, but the person in her vicinity sure did. Juk Hyul Myung licked his lips, and stood up. He came up to the table Neng Ha Young was using, and sat down on the opposite side of Neng Ha Young. Neng Ha Young opened her eyes. She could then see the smiling man in front of her. She wasn’t particularly concerned with the man. She had Shi Yup by her side, and Neng Ha Young herself was able to take on most martial artists with ease. Plus, she didn’t even know what the other side wanted yet. Becoming cautious even before anything happened just wasn’t her style. Was he here just to try make out with her? If so, she had to be thankful for that. It mean that the man in front of her didn’t know her identity. Juk Hyul Myung stared at Neng Ha Young with great care. After looking at her for quite a bit, he sighed in awe and nodded. Neng Ha Young tilted her head in confusion, as if to say she wasn’t sure if she should be offended or not by Juk Hyul Myung’s ambiguous words. Juk Hyul Myung got straight to the point right then. Neng Ha Young smiled when she heard Juk Hyul Myung’s question. Right that moment, Neng Ha Young began to feel annoyance from the man’s attitude. It was a sort of a feeling she got when her words weren’t working on others. Neng Ha Young began to think. Just who was this man in front of her? Did he actually know her identity? But wasn’t this meeting too much of a coincidence for that to happen? Juk Hyul Myung grinned. It was a happy grin that displayed his white teeth completely. Neng Ha Young, upon seeing that smile, felt a chill run up her spine. Ther person in front of her was an expert. An expert whose strength she couldn’t even begin to fathom. So why was an expert that strong doing something like this? Neng Ha Young began to think as she felt cold sweat run down her back. The person in front of her was an expert. Probably one of the harmonious stage. The energy the man revealed just now was enough to prove that. The information she had about this man was pitifully small. Except the time where she purposefully leaked her position to the Alliance, she was unnoticed by everyone. Even the Black Moon Guild itself didn’t truly know her exact location. Because of this, Neng Ha Young was fairly certain that her meeting with this man was a coincidence. It seemed Neng Ha Young had exceptionally bad luck. When she came up with the conclusion, Juk Hyul Myung opened his mouth. When Neng Ha Young said this with a cold voice, Juk Hyul Myung smiled warmly. The surrounding air fluctuated violently. When Neng Ha Young’s eyes widened in surprise, Juk Hyul Myung’s hand moved. :[. Away from the MC yet again. I hate it when author’s do this. Thanks for the chapter. Damn it. There’s even a fujoshi in this. fujoshi are legion…. there is no escape!!!! This chapter was pointless even for a filler chapter. Alot of side information from minor characters opposed to the build up of the MC. Waste of time. It’s really confusing….. this chapter….!!! And the slow translation makes it harder to remember the characters names….or who is who…..which makes it even more confusing. Its really very painful for me to when i say this…… but i think i should drop this novel. dont mind the ensj you take your time and translate the way you wanna translate. thank you for the chapter ! Skip the side chapters and only read the chapters that have the Mc in it (or someone that actually interacts with him). That’s what I do at this point. “I have bad luck” XD XD XD Thanks so much for all your hard work!! I’m actually okay with all the side character stuff. As long as it doesn’t come in the middle of a fight like last time. Still a fun chapter without the MC, Still anyone out there no what type of art is in this novel? ” Many thanks for the chapter. 10 years? Oh please. It’ll continue to be strong for a long time. …i wonder how things are going over on the other side, where cho ryu hyang is. You guys… really have a bad impression of side chapters, huh. Well, it is extremely annoying… I’ll see what I can do. So many harmonious…Is “the wall” after that? SC again? Sigh, why dont u just summarize the SC and work fully on the main one? And why the hell is SC more longer than the main one??? Its really a pain in my chrysanthemum. I dont event read this chap. just drop a comment here. I work on the SC because it is a part of the story, and I’m pretty sure the author put it there for a reason. Also, FYI, the side story was shorter than a normal chapter. Lastly, people already suggested me to just leave the side stories be for like the past 20 chapters. I get it. You guys hate side stories. So please, for the love of god, stop saying the same darn thing every time a side story comes up. I’m working on a solution. I like the side stories. It’s just hard to keep track of all the side characters and I also want the main plot to progress. There’s no reason to skip the side stories though as they’ll be important in the future.